The Cassini spacecraft has made remarkable discoveries at Saturn and its large moon , Titan. However Saturn has other natural satellites one of which is providing us with astonishing information. Enceladus (pronounced "en SEL a dus") is a tiny world 498 km in diameter . It has the highest albedo of any object in the solar system so was long thought to be an ice moon. That was confirmed by Voyager which also showed Enceladus had a smooth surface, an indication of recent geological activity. Just how recent was revealed by Cassini. 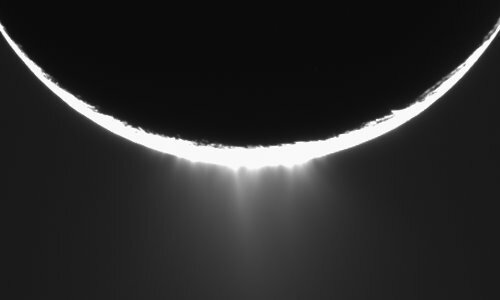 As can be seen from the image Enceladus is shooting out a giant plume of ice and water. Amazingly, the little moon has internal liquid water . "This is as astonishing as if we'd flown past Earth and found that Antarctica was warmer than the Sahara," said Dr. John Spencer, team member of the composite infrared spectrometer, Southwest Research Institute, Boulder, Colo. Scientists find the temperatures difficult to explain if sunlight is the only heat source. More likely, a portion of the polar region, including the "tiger stripe" fractures, is warmed by heat escaping from the interior. Evaporation of this warm ice at several locations within the region could explain the density of the water vapor cloud detected by other instruments. How a 500-kilometer (310-mile) diameter moon can generate this much internal heat and why it is concentrated at the south pole is still a mystery. I was amazed when I read the report and saw the image. Couldn't help but remember Arthur C Clarke set his novel 2001 A Space Odyssey at Saturn. Its certainly fertile ground for science fiction writers. A starship could enter the Solar System. It requires water for propellant and life support. 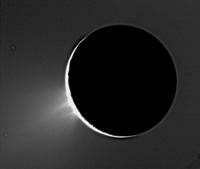 Little Enceladus would be an ideal pit stop. Something goes wrong with the fusion motor, theres a meltdown and the hot radioactive mess sinks to the interior where its still providing heat. Do I actually believe such an event occurred? No. My views on ETs are as follows. We should always keep an open mind and never dismiss the possibility. After all Ets remain hypothetical therefore their possible motivation and actions are unknown. But we should always ask for the evidence. Remember evidence is not proof. An alien visitation would be an extraordinary event therefore very good evidence is required before its reality can be established. It is too easy to let our imagination and willingness to believe fool us. Percival Lowell was convinced he saw canals on Mars which indicated a Martian civilization. Many intelligent people believed him but space probes revealed craters not canals. More recently we had the Face on Mars controversy . Recent images showed this to be an illusion too. So unless Cassini finds Clarke's Monolith I wouldn't blame Enceladus temperature on little green men. In the mean time I think we should ask Dennis to send Aaron Seven over to check out Enceladus . Addendum: A short movie of the plumes in action composed from Cassini images and more information can be found here.